Bill Klenosky was a family friend and frequent dinner guest when I was a boy. I recall UTOPIA! and it's songs, now reminiscent of Springtime for Hitler, both excessive in line with Marx brothers films. I remember the run for mayor (more than once perhaps?) and the fluid change of party (before I had any understanding of politics). Wasn't there a brother, Rudy, also involved in politics (but not music or theatre)? My father who was fond of my "Uncle Bill" but not of his habit of sniffing food before eating laced a dish with freshly grated horseradish to teach him a lesson not soon forgotten. That story remains in our family now passed on the the next generation. Your history, for which I am greatful, documents my memories for them as well. Eric, thanks for sharing that story here. When I write this sort of post, I always hope that interested parties might find it, and I’m glad that you did. Yes, there was a second run for mayor; it comes up near the end of my post. 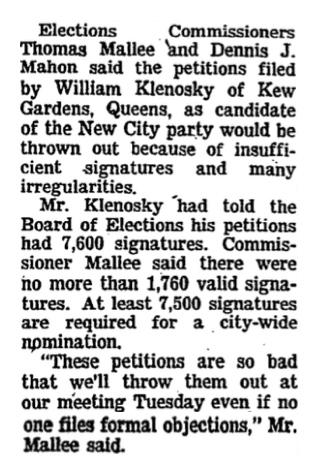 A 1984 The New York Times lists a Rudolph Klenosky as a losing candidate in a race for a seat in the state legislature. It looks like your memory is right. To answer the question of one of the commenters, yes, William Klenosky had a brother, Rudy, who was a lawyer. He also had a younger brother, who is still alive, Theodore, yclept Ted.I know this because I'm part of the same family--my father was a brother of their mother. Bill, known to us as Willie, was very energetic and imaginative. 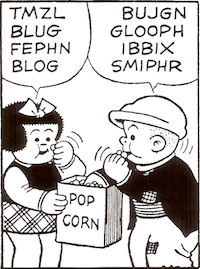 In hindsight, we wonder whether he had ADHD. He was articulate in a blue-collar sort of way, and we were somewhat boggled by his forays into politics. My impression (I was very young at the time) is that he ran for office at least wice, maybe even three times. As for Rudy running for mayor, that is something I never knew. After their parents death, and the death of my father, we were not nearly as close to their side of the family, and have lost touch with them. 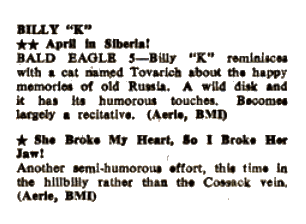 About Utopia!, my memory may play me false, but I am rather sure that neither "April in Siberia" nor the rather unfortunate "B" side, "She Broke My Heart So I Broke Her Jaw," were in that musical. As for it being an odd subject for a musical, that seems a somewhat narrow view, considering that there was a television show just a few years ago with an extremely similar concept.Though of course, one can argue that the bar is very low for television series concepts. Utopia! was inspired, I know, by the Mercury space program, and the notion that if an orbital vehicle landed off-course, it could potentially end up in a valley in the Rockies where there might have been an isolated settlement. One never knows. Of all his enterprises, I thought Utopia! actually was one that had considerable merit. Thanks for adding to the story, Broadway Jimmy. Yes, the songs on the 45 predate the show. “April in Siberia” is among the Utopia! songs listed in The Off Broadway Musical, 1910–2007. Here’s the page that describes the show. 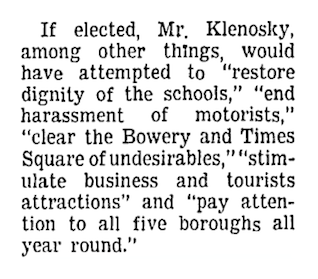 Wow, as a young child I participated in a parade through the streets of Kew Gardens, NY in support of Billy K. Klenosky's 1960 election campaign. He gathered neighborhood kids at his home on Lefferts Bl, provided campaign signs on sticks, and we marched up and down Lefferts Bl. Larry, thanks for sharing that scene here. It makes me happy that people who remember Mr. Klenosky can find him here.